Material:cotton. Size:Bottom about 7-8cm, high about 9cm. Suit for small animal /rat/hamster/gerbil/mice. Feels very soft, smooth, comfortable, ventilate. 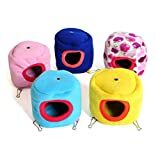 Comfortable bed provides your small animal with a nice and warm place for sleeping in autumn and winter. Please allow 1-2CM due to manual measurement errors. Part of the little friends range of small animal soft toys. matching items are available. superb quality and one of the larger small animal items available on the market. it is made from quilted type material and attaches to the cage with clips. There are two options for pets who can either lounge on the top layer or snuggle in the bottom one. Measurements: bottom section 40cm (16″) along the front edge. top section 30cm (12″) along the top edge and 30cm (12″) deep. 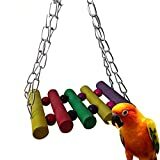 This item will comfortably fit 2 adult ferrets or 5+ adult rats. this toy is part of the little friends specialist range of small animal products. similar matching items are available if you want to coordinate your cage. Please check regularly for signs of chewing and replace as necessary.